Tim’s classic Plymouth was suggested to us by a reader and you can see more at his photostream by clicking here. Body by Plymouth. Soul By Satan. 1983 saw the film adaptation of the Stephen King novel Christine, starring a dilapidated 1958 Plymouth Fury with a Herbie-like personality instilled within it. Only this car was nothing like Herbie. TLCB favourite Ralph Savelsberg aka Mad Physicist has added ‘Christine’ to his ever-growing garage of superb movie cars. All the photos of the build can be found on Flickr here, and we’re delighted to announce that Ralph has also been cornered by The Lego Car Blog Elves, becoming the penultimate builder in our Master MOCer Series. 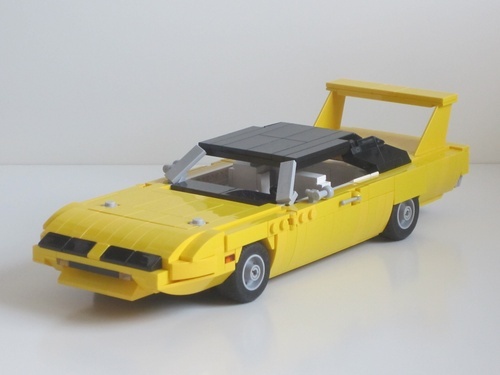 Mr. Savelsberg’s interview in The Lego Car Blog’s Master MOCers Series, where he explains how he started building LEGO, what has influenced his style, and how he creates amazing models such as the Plymouth above is available now; simply click this link to read his story! This spectacular Model Team creation was discovered on Flickr by one of The Lego Car Blog’s multitude of Elves (if anyone knows what the collective term for Elves is please let us know). It’s a 1970 Plymouth Superbird, built by the car geniuses Bing-Bong Brothers. The Superbird was the American manufacturers first attempt at applying downforce to a race car, with the aim of generating more stability and grip for NASCAR oval racing. The rules stated that the race car must be based on a road-going vehicle, and thus Plymouth created just under 2,000 Superbirds for the road, so you could look as ridiculous on the street as it looked on the track. You might think the colossal rear wing was placed optimally to generate maximum downforce whilst minimising drag, but actually it’s that high simply to allow the trunk lid to open! It’s estimated around 1,000 Plymouth Superbirds survive today, and those that remain are amongst the most expensive and sought after muscle cars ever built. You can see more of the ‘Brothers far more affordable LEGO version at their excellent photostream via the link above. It’s the weekend, hurrah! And we’ve got a very special post for you today. 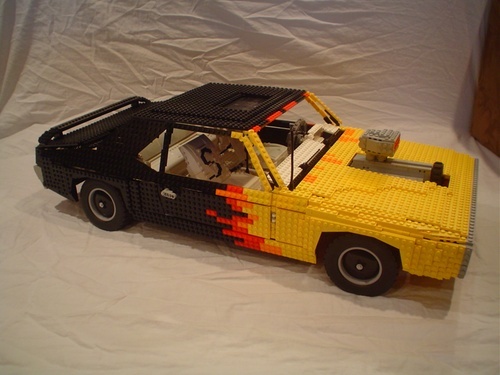 MOCpages-based Henrik Hoexbroe has featured on The Lego Car Blog a number of times over the past two years with his superb Town-scale vehicles of all descriptions. Henrik uses these cars to add life and realism to his ‘Mega MOC’ Town displays, filling the streets with all sorts of wonderful classic metal. Henrik is currently working on his latest large Town scene and has shown a preview of the vehicles that will feature within it. They range from historic vans, buses and trucks (above) to well-known and easily identifiable classic cars, like the Ford Capri, Mercedes Taxi and Citroen DS (below). We highly recommend a visit to Henrik’s stunning MOCpages preview here, and we can’t wait to see the finished Town. We know he’s a reader of The Lego Car Blog, so Henrik, if you’re reading this, we’d love to interview you upon your Town’s completion! This evil brown tanker originates from the 1971 cult film ‘Duel’, directed by Steven Spielberg and based on the short story by Richard Matheson, in which a deranged truck driver hounds a sales rep across the California desert. We won’t spoil the ending if you’ve not seen the film, so instead we’ll direct you to trapjewad‘s Flickr page where you can pick up some clues. Uh oh, looks like the Bandit is about to spend some time holding on to his soap very carefully. _lichtblau_‘s 1975 Pontiac and Plymouth Gran Fury police cruiser meet for this roadside shot on Flickr. Rick S has built this brilliant Plymouth Road Runner. Check it out on MOCpages. Just watch out for the painted tunnel and falling anvil. Meep meep!